The United States Supreme Court showed its bias toward academic degrees, and its predilection to undervalue the dictates of experience on the streets, when it unanimously ruled in mid-February that it did not matter that a drug-sniffing dog might perform abysmally in the field. This elevation of credentials over demonstrated skill should come as no surprise: Of the nine justices sitting on the high court, five were full-time academics at some point before joining the Court, three were adjunct professors and only one – Clarence Thomas – earned his stripes, such as they are, exclusively in the real world. But this gets us ahead of ourselves. The serious question to ask about the Court’s bizarre opinion in Florida v. Clayton Harris is how it is that nine intelligent and accomplished jurists could have overturned an opinion of the Florida Supreme Court that relied on the most elemental experience in an important area of citizens’ privacy rights. The state high court ruled that just because a drug-sniffing dog received training and a certificate of graduation does not mean that the dog should be deemed capable of detecting by smell whether an automobile, container, suitcase or other receptacle is hiding illegal drugs. Rather, the court ruled, a dog’s reliability must be gauged by how he actually performs. In particular, this pivotal question must be asked: Does the dog have a history of really being able to detect the presence of hidden drugs, or has the animal simply signaled drugs in such a large number of encounters that by the law of averages he managed to catch a few real stashes? Or has the dog simply learned that the best way to please his handler, and perhaps earn a treat, is to signal the presence of drugs? Put another way, if a dog’s number of true drug identifications is overwhelmed by a much larger number of false alarms, can the dog be said to be reliable? Reliability is a crucial standard in the law of search-and-seizure. The Fourth Amendment to the U.S. Constitution assures "the right of the people to be secure in their persons, houses, papers, and effects, against unreasonable searches and seizures." As such, the law requires that an officer have "probable cause" to believe that a search would turn up contraband or other evidence of crime before he is allowed to conduct a search. This is why there has been such a heated debate between law enforcement officers and law-and-order advocates on the one hand, and civil libertarians and other privacy advocates on the other, over the question of whether a wagging tail from a drug-sniffing dog should be enough to allow a policeman to search a vehicle or other private receptacle that the owner otherwise has a reasonable expectation will remain private. This particular battle between the Florida high court and the U.S. Supreme Court boiled down to whether Aldo, the drug-sniffing dog that signaled the presence of illegal drugs in this case, had a history of signaling the presence of such drugs even in many cases where no drugs were found. In other words, can Aldo really supply "probable cause" to believe that drugs will be found if he does his tail-wag routine regardless of whether drugs are or are not in fact present? Does Aldo’s actual performance history indicate that his degree of accuracy is no better than the rule of chance? The Supreme Court ruled, essentially, that Aldo’s actual accuracy doesn’t matter. Justice Elena Kagan wrote for herself and the other eight justices on the U.S. Supreme Court that a "flexible, common-sense standard" of what constitutes "probable cause" is better than the rule-of-thumb enunciated by the Florida court, which held that "the State must in every case present an exhaustive set of records, including a log of the dog’s performance in the field." In the case of Clayton Harris, Officer William Wheetley, a K-9 unit officer in the Liberty County, Florida Sheriff’s Office, pulled Harris over and let his drug-sniffing canine companion loose to explore the exterior of Harris’ truck. 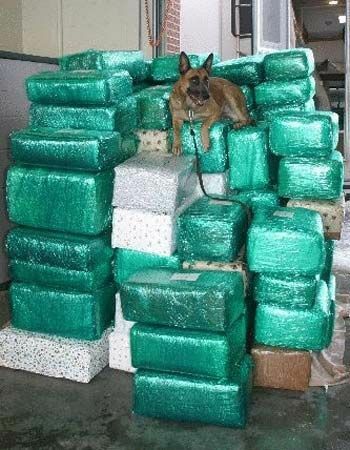 Aldo was trained to detect a certain array of illegal drugs, and he "alerted" to the presence of such drugs in the truck. Well, it turned out that the truck did not contain any of the drugs that were in Aldo’s academic repertoire but did have pseudoephedrine, used in the manufacture of illegal methamphetamine. No matter that Aldo was not trained to detect pseudoephedrine – the trial court in Florida deemed the search constitutional, based upon the "probable cause" supplied by Aldo’s wagging tail. This was the decision reversed by the Florida Supreme Court, but subsequently upheld by the U.S. Supreme Court when it disagreed with the Florida high court. It did not matter much to the U.S. Supreme Court that Aldo had no training to detect the particular drug found and in this very case had signaled the presence of drugs other than those which in fact were found. Nor did the court focus on the number of times in the past that the dog signaled the presence of illegal drugs when none turned up. What mattered was that he had successfully completed "a 160-hour course in narcotics detection offered by the Dothan, Alabama Police Department" along with a similar "120-hour course given by the Apopka, Florida Police Department." The dog even went on to graduate study and received "a one-year certification from a private company that specializes in testing and certifying K-9 dogs." This sterling curriculum vitae was supplemented by a "40-hour refresher course in Dothan." Does all of this education truly amount to naught, just because Aldo might have a disconcerting habit of signaling the presence of drugs where none are found, or of signaling drugs for which he was not trained? In fact, it would have been difficult in this particular case to make an inquiry into how often Aldo signaled the presence of illegal drugs where none were found, because Officer Wheetley "acknowledged that he did not keep complete records of Aldo’s performance in traffic stops and other field work; instead, he maintained records only of alerts resulting in arrests." In other words, the dog’s official performance record consisted only of his successes, never balanced against his failures. Still, the U.S. Supreme Court deemed the dog’s tail sufficiently reliable to meet the Fourth Amendment’s standard of "probable cause" to believe that a search of the truck would produce contraband. Such is the power of a diploma. The justices, of course, had to try to justify this patently absurd conclusion. They sought, they claimed, to reject "rigid rules, bright-line tests, and mechanistic inquiries in favor of a more flexible, all-things-considered approach." "Probable cause," the court rationalized, "is a fluid concept." They decried the justices on the Florida Supreme Court for elevating "records of a dog’s field performance as the gold standard in evidence." (The federal justices have apparently forgotten the warning by the great Justice Oliver Wendell Holmes: "The life of the law has not been logic; it has been experience.") The nine justices concluded: "Evidence of a dog’s satisfactory performance in a certification or training program can itself provide sufficient reason to trust his alert." Put another way, since the dog passed his examinations and obtained his degrees, his judgment must be trusted, even when the privacy rights of a citizen are at stake, and even when actual performance in the field does not measure up. One tries not to be cynical about the reason for such rare agreement among all of the liberal and conservative justices on the high court. But one cannot ignore the single element that is found in the backgrounds of all but one of the justices. Justice Elena Kagan, who wrote the high court opinion, taught at the University of Chicago and later at Harvard Law, where she became dean. Justice Stephen Breyer was a law professor at Harvard, and Justice Antonin Scalia held a similar post at the University of Chicago. Justice Anthony Kennedy taught at McGeorge School of Law at the University of the Pacific. Chief Justice John Roberts was an adjunct professor at Georgetown, while Justice Sonia Sotomayor held a similar position at New York University and Columbia Law School. It is difficult to figure out why Clarence Thomas went along with his eight academically-steeped brothers and sisters on the Court. Following his usual practice, he asked no questions from the bench during oral argument, giving no indication why he, too, supported the notion that it’s the academic degree—not the demonstrated skill—that counts.